Name: The Selling Family by Jessica Larrew. Price: Varies by which program/product you buy, but it can be anywhere from $27-$100’s. Overall Rating: 7 out of 10 stars. This is a fantastic, high quality program that offers immensely good training on various ways to monetize on the internet, but ultimately, what made it 7 stars was that it’s costly and I wish it were all available in one program instead. What is the Selling Family? It is a program which has different training modules on ways to make money online, mainly from selling on Amazon and being an owner of a product to sell on Amazon. There’s also free blogging tips and a lot of free content on the website from which you can learn to do things such as make websites, establish an authority blog and Jessica (the creator of this whole place basically) doesn’t mind sharing how she does what she does, which is awesome and lends even more legitimacy to the overall program. -There is an immense amount of free content available for people to view on the site. -Jessica and her family really do back up their claims and show you through their training how to repeat their success. A lot of it stems from making and selling your own products, and she shows you how to make all of this. -Overall, this is one of the best programs (not the best, here is the one better than that) I’ve reviewed and after having seen so many scams, especially recently, it’s awesome to finally stumble back onto a legitimate one. -I don’t really like that there’s SO many products to choose from and that there’s prices for each one. It adds up to a lot of money spent (I’ll get into the prices and products shortly). -I was a bit confused when I landed on the site because there’s 3 options to choose from to begin a business, and each has it’s own training. I wanted to see it all consolidated into one big training program, it would make it easier for someone who is also confused not to worry that they chose the wrong product. There is only 1 course here. 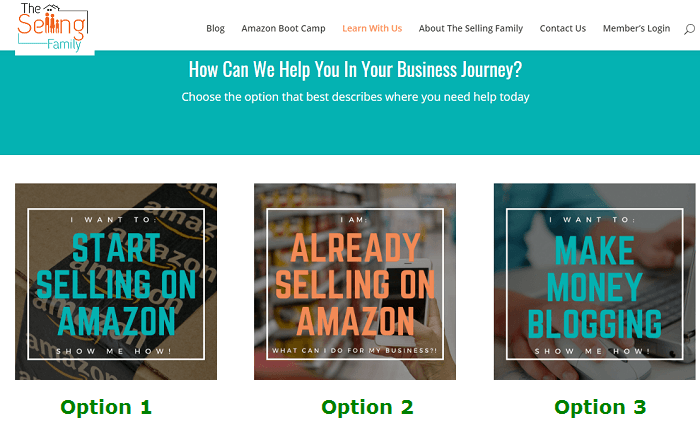 it is called the Amazon Bootcamp and it is arguably the most comprehensive and highest value course in this entire program. You will learn to build a full time income through Amazon the same way Jessica does. Video tutorials, a community and extensive training is provided. This course is mainly best for beginners to the whole Amazon business model. Price: $197 one time for a limited access. Or $99 a month for a few months OR get everything for $347, one time. This course is for people who are currently doing business on Amazon and it will teach you to expand your sales in various fields, besides just on Amazon, through things such as where to buy very low cost items to resell for a good profit. There’s 14 different eBooks and programs in this section, each ranging from $20-$40 in costs. Added up, this can be quite expensive, but that’s why they give you choices and let you pick which one best suites you. One which is a 30 day website making course for $97 where you build an entire blog. A second one on making training on an eBook, for $67. These can be very good sellers if you know how to market them. And a third on being a very successful Amazon affiliate for $65. Jessica showcases how you can make $1,000’s in doing this. I’ve got free info on this stuff here. As someone who excels at this particular area and has done sales on Amazon, I can tell you that this is possible, and I have my own ways of doing business through it that has earned me good money over the years, including a method by which I was blogging about the hottest selling products in a particular niche market on Amazon (diet books), getting a lot of traffic from this on Google to my blog and then making sales promoting those products OR higher priced items for bigger commissions. It made me $1,000’s in the process so I know full well about the potential. Final Rating: The Selling Family. 7 out of 10 stars. Extremely awesome content and training, but again, my biggest thing is that there’s so many programs/eBooks to choose from that it would be nice to have it all in one single program, and that if you pay for everything, it’s pretty expensive stuff (well over $500). The biggest pros of The Selling Family is that it provides immensely good content, even on it’s free to read blog as well as great training which you can replicate to make your own success online. And the biggest cons The Selling Family has is that there’s just so many low priced programs to pick from, as well as some pretty expensive training options that it can be confusing and expensive. I totally get the idea behind segmenting different ways to make money online, as it makes for more ways to sell different products, but at the same time, I am not a fan of paying so much for all of this stuff and if it was all consolidated like I said before, this program could easily be my #2 recommendation (note, I said #2). It contains pretty much every kind of training The Selling Family has, and in all honesty, FAR more (100,000’s of training modules, including a bootcamp course for ALL). And with the cons I listed about the Selling Family having too many different products, all for different prices, Wealthy Affiliate has all of it’s training either for free to check out OR $49 a month for EVERYTHING included in that. For example, one of the training programs in The Selling Family is about making a website and it costs $97. In WA, this is included free with your training and you can have a website up and running in under a minute, WITH training attached to it to help you get it going. I am absolutely an instant fan of The Selling Family, but I have to call out the cons when I see them, and there are some noteworthy ones, especially in the financial department, which is one of the reasons I prefer Wealthy Affiliate instead. Still if you go with the Selling Family, I would tell you that you’d be quite happy with their training. They are truly a legitimate program and I cannot deny that. But I also can’t deny that Wealthy Affiliate is a bit better in both the financial department and learning department as it offers training more in total for a far less price in TOTAL. Is AWOL Academy a Scam? This Review Reveals a Better Option. Global Affiliate Zone Review. Is GAZ a Scam? I Wasn’t Happy. Is Six Figure Mentors a Scam? Why I Left This Program. Is The Make Money Online Niche Really Too Competitive?